Provides added protection from high voltage surges such as lightning strikes. UL grounding requirements for HDMI® cable offer protection from hazardous voltages that may occur on the shielding. Because of the physical length of ground wires, UL grounding systems may appear as an open circuit to lightning strikes.These strikes cause high frequency surges and provide no protection from surges getting into a home and destroying your HDMI® TV/monitor and HDMI® sources/equipment. 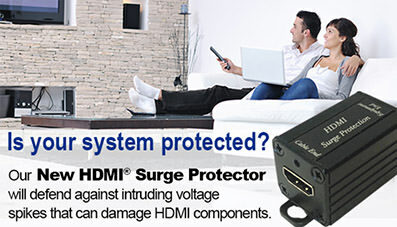 Provide protection for HDMI® equipment. Passive unit so power is not needed. Quick and easy in-line application.